I’m not trying to make you look bad, honestly. 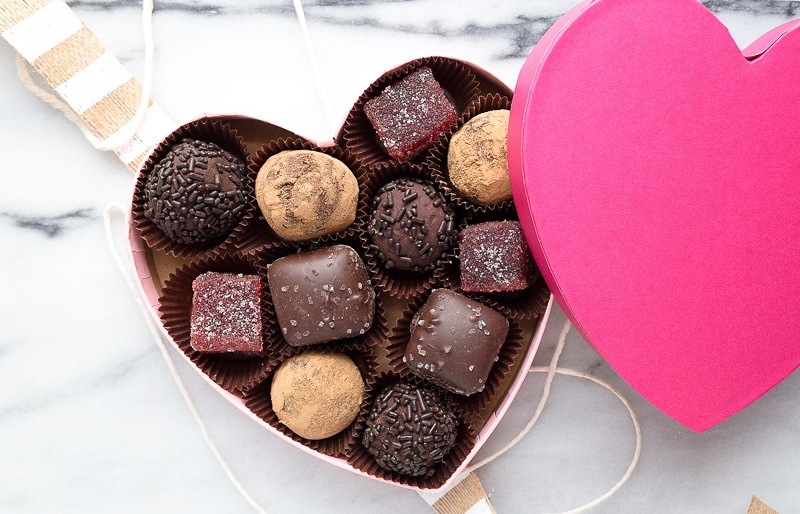 I’m willing to admit that making my dude a homemade box of chocolates with these red wine chocolate truffles is a bit of an over-achievement. But, I have a little secret up my sleeve. So, yes, I went to 3 hobby stores to find the perfect-sized heart boxes (these are from Target), and yes, I made strawberry pate de fruit. However, I only made 1 type of truffle, but I rolled them in two different coatings (one dark chocolate sprinkles, one cocoa powder), so it looks a whole lot more impressive. But, I’m not done with the secrets. You see those perfect salted caramel squares? I plucked them from my favorite box of chocolates (fair-trade Ecuadorian dark chocolate from Heifer International for the win!). I would feel guilty about it for a hot minute, except good chocolate for a good cause is something I can get behind. 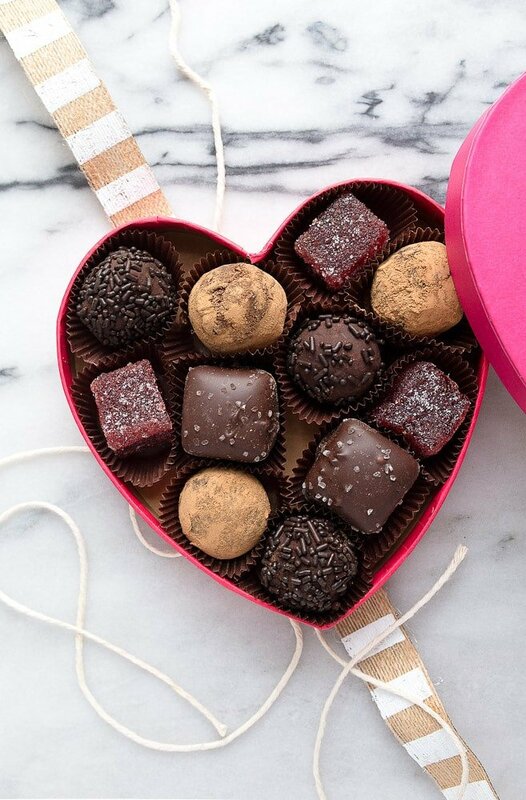 So, here’s your game plan to impress your dude (or your lady): make two types of homemade candy and then buy the rest to fill out the box. I have a lot of homemade candy recipes you can choose from! You have lots of options. I chose the strawberry pate de fruit and the red wine chocolate truffles recipe that I’m sharing today. Mix and match, make one, make three, make them all, and fill up a heart-shaped box for your babe. You win at Valentine’s Day! 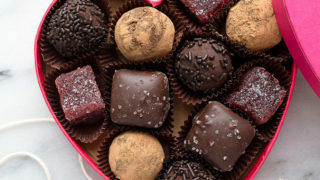 Chocolate red wine truffles for a DIY box of chocolate for Valentine's Day. Heat the heavy cream in a small pan on the stove until small bubbles form around the edge of the pan, but do not let it boil. (If you're using canned coconut cream, use the same method). Place the chopped chocolate into a small bowl. Pour the hot cream over the top and let sit for 3 minutes without disturbing. Slowly begin to whisk in the vanilla and espresso powder (if using). Finally, whisk in the wine. Place the bowl in the fridge for at least 2 hours, or up to overnight. (If the chocolate rests in the fridge for more than 2 hours, it may need to sit on the counter for 30 minutes to soften before rolling). When ready to roll, have the sprinkles or cocoa powder (or both) in small shallow bowls. Using a cookie scoop or 1-teaspoon measure, scoop out balls of chocolate. Roll them in your hands into perfect balls--the heat from your hands will help form them into balls. Roll each ball in the cocoa powder or sprinkles (or both!) and place on a plate to set. hey girl- these look amazing! Great idea! Lucky, those look so good! I made these for my boyfriend for Valentines Day and while they taste fantastic they’re so mushy there’s no way to roll them into balls! How do you get your mixture firm enough to roll? I had them in the fridge for 5+ hours and still no good. Currently trying the freezer. WHAT. That’s crazy! I refrigerated them for less than an hour and they were firm. Did you measure correctly? Double-check the ingredient amounts. And make sure you’re using 8 ounces of chocolate by weight, not measuring in cups or anything. 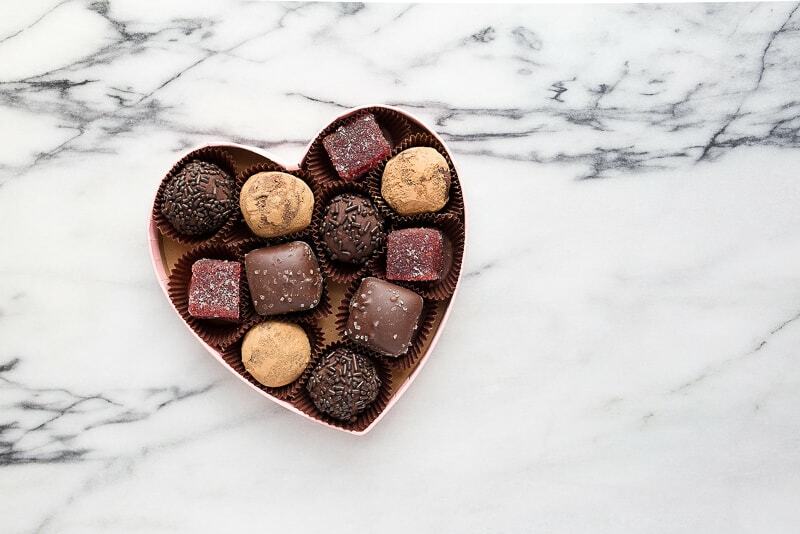 How creative to make your own box of chocolates, I would have totally swooned. Did he swoon? Lol. Hope you had a wonderful Valentines day! Christina, you’re just over here, killin’ the game-as per usuaaaal lol. This is the cutest! These are so cute. I love the idea. It looks like I could vary the wine or spirits to our liking. Perfect surprise for Valentine’s Day!